Native son Mathew Barlow dominated the Mens 19-29 Super-D field this weekend at the Yeti Cycles 7th Annual Wildflower Rush mountain bike races in Crested Butte, CO. Born in Crested Butte and sponsored by flyingcracker.com, Mat jumped on his bike in the #5 slot after the LeMans-style running start, stalking the lead pack for 2/3 of the course. When a rider in front crashed Mat grasped a prime passing opportunity and within seconds gapped his competitors for an eventual wide margin of victory. This isn't the first podium finish for Mr. Barlow. 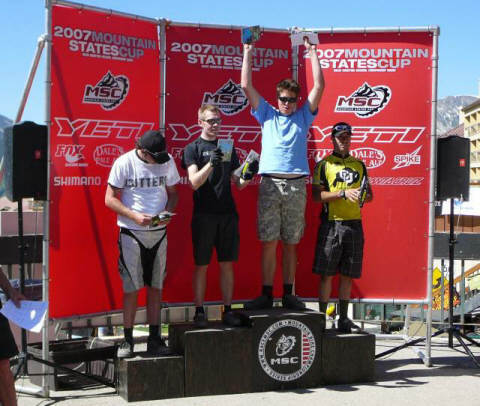 Last year at the NORBA National Championships in Snowmass, CO Mat placed second in the Mens 19-29 category in Super-D. It was this impressive finish against a top field that finally convinced the flyingcracker staff to arrange sponsorship for the young rider. After the race we asked the Boulder resident how he felt about his first Super-D win in front of a "home" crowd. "Well, last year I sat around the base area talking trash with Mark Sevenoff and we completely missed the start. So this Super-D win is sweet redemption. I always felt I had the power and technical skill to win; the main challenge is getting up early enough for an 8am start. Huge thanks to team manager Abby Patterson for rousting me out of bed and ensuring that all flyingcracker team riders got to the start line well before the race began. And thanks to my homies for all your support." Also making a splash at the Wildflower Rush was seventeen year old CB South neighbor and flyingcracker friend Will Curry. On Saturday, riding for Brick Oven / CB Builders, Will dominated the Junior Sport Men 18 & Under category in the Shimano Wildflower XC race, winning by over 1:51. The next day Will backed up his first place XC result with a 54 second margin of victory in the Junior Men 18 & Under Super-D. Our feeling is that any racer who wins both the XC (which requires aerobic endurance) and Super D (which requires anaerobic power) events is someone to watch. We're encouraging Will to move up to Expert category in his next race for some stiffer competition. Last, but not least, in the "used to live here" department Mike West, 32, son of former C.B. residents Ineke and Brad Boyce, handily defeated the rest of the field in the Mens Open category in Super-D. Mike's time of 11:11.34 was 26 seconds faster than his nearest competitor. 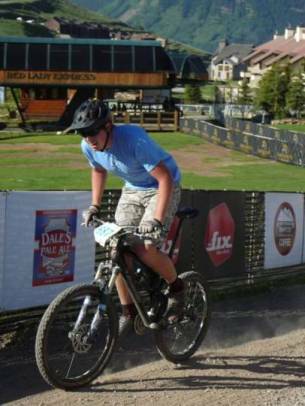 Mike also placed 3rd in Men Semi-Pro Downhill and 14th in Pro Men XC. Laura Anderson 3rd Open Women Podium Finish! 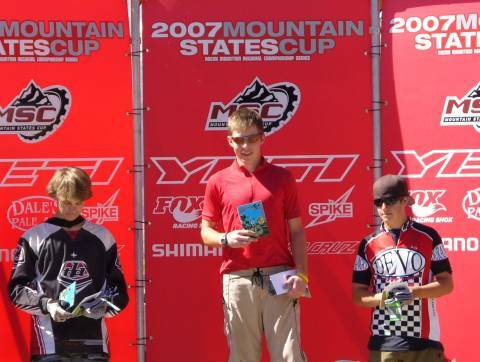 Will Curry 1st Junior Men 18 & Under Podium Finish! What is Super-D? Unlike XC races which cover 10-30 miles and thousands of feet of climbing, Super D races are short (~3 mile) primarily downhill courses with winning times in the 11-13 minute range. They combine sections of singletrack with ocassional jeep roads for passing. Although the courses are gravity-fed the singletrack and uphill sections penalize heavy bikes (e.g. DH rigs). If XC can be considered a strategic race, Super D is "controlled aggression" (and lots of fun). 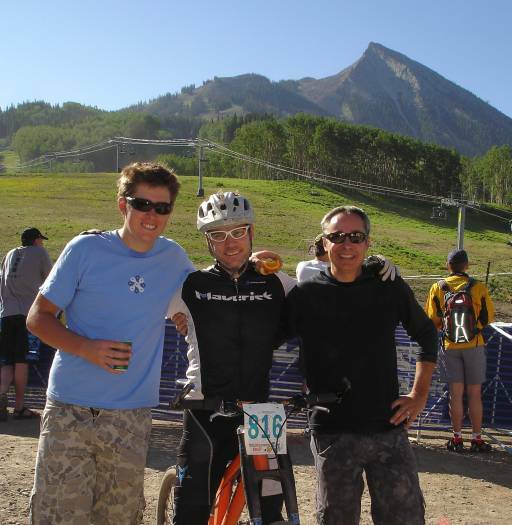 The Yeti 7th Annual Wildflower Rush is the third event in the Mountain States Cup Rocky Mountain Regional Championship Series. More race results from the 2007 Wildflower Rush can be found here.